Crafters Deluxe 2-in-1 Engraver/Sculpt Kit - Dino Rentos Studios, INC. 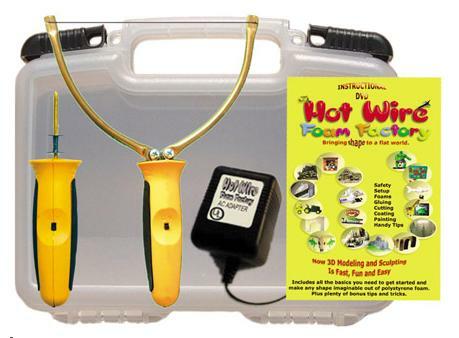 The Sculpting Tool (with 6 wires), Engraving Tool, Crafters Power Supply, and 90 minute Hot Wire Foam Factory DVD, all come in a handy carrying case. It's All In the Details! The Engraving Tool is perfect for engraving bricks, blocks, stones, words, and other shapes for detailed looking walls, abutments, portals, slats, cobblestone roads, signs and more. A fine finishing tool for detailing any type of 2-D or 3-D sculpture or model. Only the tip heats up. (approximately 5” long).